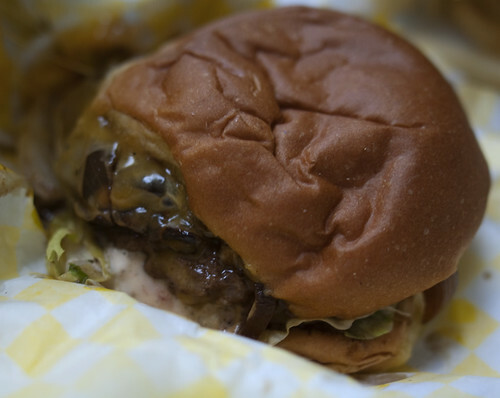 I have been on a burger discovery lately, and eaten at a lot of burger joints… all for you (yeah, my wife isn’t buying that either). 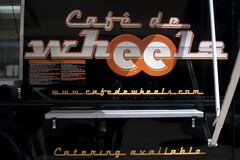 Cafe de Wheels is one of the new food trucks in Cincinnati. They are also the first that is a fully equipped kitchen on wheels. When they first started, they served crinkle-cut fries. Talking to Tom Acito, the owner, he said they were not quite as good as he remembered, so he switched to thin cut fries. The same kind you can find at Zip’s or McDs. I liked the crinkle-cut, but I think the thinner ones are better. I am not really a cheeseburger fan, mainly because I do not like American cheese that much, so initially I was getting the Wheels without cheese. But lately I have been getting Cheddar instead of the American, and I like it a lot. They have two other burgers on the menu. The Northside of Beef comes with 2 patties for a total of 2/3 pound, cheese and bacon. The Tower of Power is one patty, 3 oz of BBQ pulled pork, and cheese. 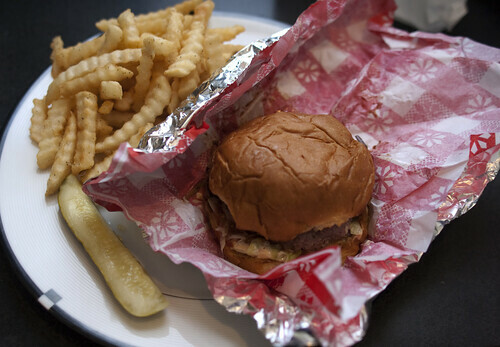 Until recently I have stuck to the Wheel’s burger, which was my favorite burger in the city (more on that later). Wheels Crispy Chicken: seasoned flour, buttermilk than seasoned flour.Lettuce, tomato and cheese. Cuban- Reuben: Slow roasted pulled pork shoulder, balsamic onion marmalade, sauerkraut and a touch of sweet BBQ Sauce surrounded by a melted Swiss CHEESE on Shadeau White. Funky Fries: Large fries with 3 oz. BBQ Pulled pork and Cheddar over them. They recently added a new burger. It is not on the menu yet, and they are still trying to finalize the name, but it is tentatively called the Cowboy. 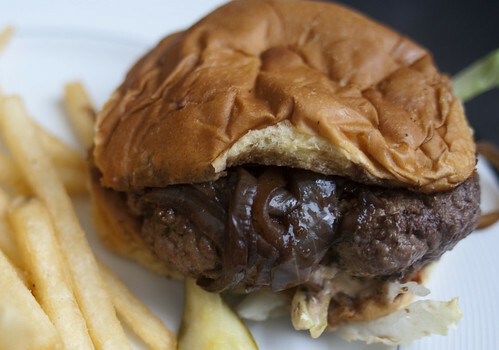 It is basically a Wheels burger with onion straws, BBQ sauce and Swiss. They had me at onion straws, so I had to try it. I wasn’t sure about the Swiss, but I do like to try new things with as few changes as possible the first time, so I bit the bullet. My response? Yeah-ha! This is now my new favorite burger. 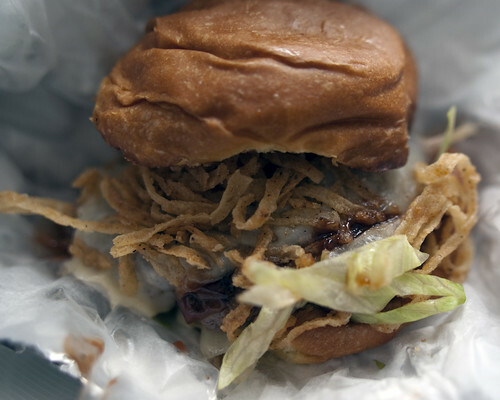 The onion straws on the burger are every bit as good as I expected, the Swiss and BBQ sauce add a nice flavor as well. They are a truck, so you will need to find out where they are. Luckily they do have their schedule online. They seem to split their downtown lunch time between Court & Vine and 5th & Race. They are typically on Main for Second Sunday in OTR, been outside for a few Watch This events, and shown up at a number of venues around town. You can follow them on Twitter at @burgerBgood or check out their Facebook page. They are definitely leveraging technology. You can order by phone or text message. I order by e-mail to their text message number all the time. It works great, I show up at the window and it is ready. They have a card you can get stamped. When you get 10 stamps you get a free burger.I think the reason I am the Mayor of Cafe de Wheels on Foursquare could be because I am already on my third card… or perhaps a complete lack of discipline. So take it from the Mayor, this is a mighty fine burger. I can’t guarantee you that it will be your favorite, but if you don’t like it, you don’t like burgers. It shows again how good ingredients (Avril Beef, Servatii’s hamburger buns, Shadeau rolls) and creative combinations yields good eats. Thanks Sherm! We appreciate it more than you know!